The functionality of publishing content to WordPress is provided through an Enterprise Server plug-in. 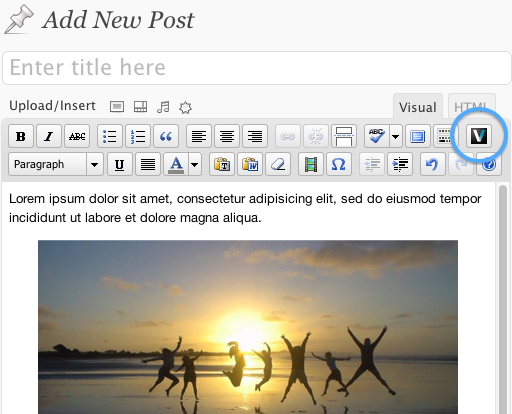 This plug-in provides a Publish Form template with which a post can be published to WordPress. This article describes how to integrate WordPress in Enterprise to make it possible to publish from Enterprise to WordPress. Steps need to be performed in WordPress and in Enterprise Server. It is assumed here that a WordPress Web site is already fully set up and running. Tip: To install a WordPress Web site, download the latest WordPress release and follow the instructions about installing WordPress. 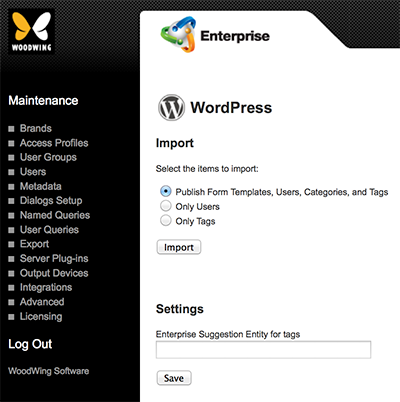 Enterprise supports WordPress version 3.7 and higher. If you already have a WordPress Web site, please check its version. 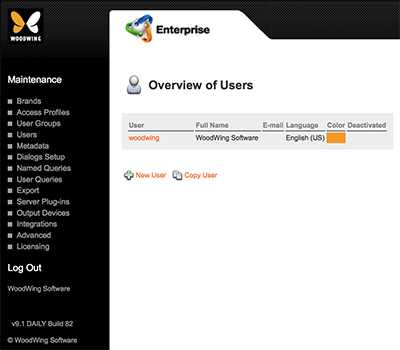 The WoodWing Enterprise plug-in allows WordPress to communicate with Enterprise Server. Step 1. Download the Enterprise WordPress Integration Module from the software download page. Step 2. Unzip the downloaded file. A folder named 'ww_enterprise' is created. Step 4. Access your WordPress Dashboard. Step 5. In the menu bar on the left of the screen, click Plugins. The Plugins page appears. Step 6. Locate the plug-in named WoodWing Enterprise. Step 7. Activate that plug-in. Figure: The activated WoodWing Enterprise plug-in. The Publish Form for publishing content to WordPress contains a Gallery field with which multiple images can be uploaded for use as a gallery such as a slide show. This requires the NextGEN Gallery plug-in to be installed. Note: Installing the NextGEN Gallery plug-in is optional. When the plug-in is not installed, the Gallery field will not be included in the Publish Form. Step 1. Access your WordPress Dashboard. Step 2. In the menu bar on the left of the screen, click Plugins. The Plugins page appears. Step 3. At the top of the page, click Add New. Step 4. Search for the plug-in named NextGEN Gallery. Step 5. In the Search results, click Install Now for the NextGEN Gallery plug-in. Step 6. Follow the steps on screen. Note: For details about manually installing this plug-in, see the NextGEN Gallery documentation. The use of thumbnail links is not supported and therefore this functionality needs to be disabled. Step 2. In the menu bar on the left of the screen, click Gallery followed by Gallery Settings. The Gallery Settings page appears. Step 3. Click NextGEN Basic Slideshow. The slideshow settings appear. Step 4. For the Show thumbnail link option, choose No. In order for Enterprise Server to access WordPress and to publish from WordPress, a default user needs to be created. Step 1. 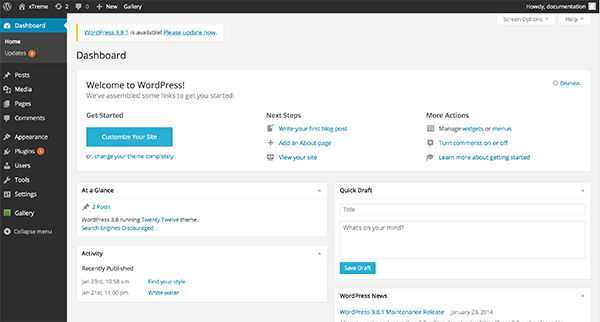 Access your WordPress Dashboard and click Users followed by Add New. The Add New User page appears. Use a name that does not exist as a user in Enterprise Server. Note: When a user publishes a post from Content Station, Enterprise Server tries to use the name of that user as the author of the post. However, this works only when the user name in Enterprise corresponds to a name in WordPress, the user has the correct WordPress role assigned, and the user names from WordPress are mapped to the names in Enterprise Server. If this is not the case, the name of the default user is used instead. Make sure therefore that the name is descriptive. From the Role list, choose Administrator. Step 3. Click Add New User. Note: If none of these conditions are met, the name of the default user (see step 5. Creating a default user in WordPress) is used. Step 1. Make sure that each user who is allowed to publish posts to WordPress from Enterprise exists in WordPress. Step 3. Verify that the way the user name is written in WordPress is identical to the way it is written in Enterprise Server so that a proper mapping can be made (the actual mapping is done in step 12. Importing Publish Form templates, users, categories and tags in Enterprise Server). Note: The mapping is not case-sensitive. Example: Mapping 'WoodWing User' to 'woodwing user' will be successful, but mapping 'R. Smart' to 'Rob Smart' will not. Every post in WordPress is filed under one or more Categories, allowing you make the post part of groups and subgroups (for more information, see the WordPress documentation). Step 1. Access your WordPress Dashboard and click Posts followed by Categories. The Categories page appears. Step 2.Create as many Categories as needed. Note: The name of the Category should not start with a dash (-) or a space. 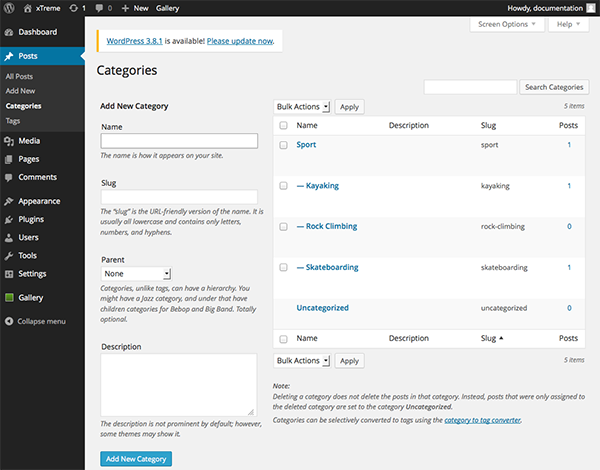 Figure: The Categories page in WordPress. Note: Categories that are created after the integration is completed can be imported at any time by using the WordPress Maintenance page. When publishing an article to the Web, it is common to include tags (keywords) so that users can use these as a search tool for locating other articles with similar content. (For more information, see the WordPress documentation). Step 1. Access your WordPress Dashboard and click Posts followed by Tags. The Tags page appears. Step 2.Create as many tags as needed. Figure: The Tags page in WordPress. Note: Tags that are created after the integration is completed can be imported at any time by using the WordPress Maintenance page. The WordPress Server plug-in allows Enterprise Server to communicate with WordPress. It also provides a Publish Form template that is used for creating the Publish Form which the Content Station user uses to write the WordPress post. Step 1. Download the file named Enterprise WordPress Integration plug-in from the software download page. Step 2. Unzip the downloaded file. A folder named 'WordPress' is created. Step 5. Make sure that the plug-in named WordPress Publishing Connector is enabled (as indicated by the green icon in front of the name). If needed, resolve any conflicts. The installed WordPress Server plug-in needs to be configured with the details of the WordPress Web sites. Unique name. This is the logical name of the WordPress site and must be unique within the array. The number of characters used should be no more than 10 characters (excluding dashes '-'). url. The URL of the Web site. Must not end with a forward slash '/'. username. The name of the user that was set up under 5. Creating a default user in WordPress. This user needs to have administrator rights. password. The password for the user that was set up under 5. Creating a default user in WordPress. certificate. (Optional, required for HTTPS (SSL) connections only. Requires Enterprise Server 10.0.3 or higher, or Enterprise Server 10.1.1 or higher. ) The full file path of the local CA certificate file (in PEM format). Step 1. Access the User Maintenance page for the user. Step 2. Click the name of a user who is allowed to publish posts to WordPress. Step 3. Verify that the way the user name is written in Enterprise Server is identical to the way it is written in WordPress so that a proper mapping can be made (the actual mapping is done in step 11 see 12. Importing Publish Form templates, users, categories and tags in Enterprise Server). Publishing to WordPress is done in Content Station through the use of a Publish Form. This Publish Form is based on a Publish Form template which is defined in the WordPress Server plug-in. Importing the data from the Server plug-in creates the Publish Form template in Enterprise Server. Enterprise Server can publish posts by using the name of a WordPress user. For this to work, the names of the WordPress users need to be mapped to the names of the Enterprise Server users. Any categories that are defined on the WordPress Web site can be made available as an option to choose from a list in the Publish Form. These categories therefore need to be imported into Enterprise Server. Any tags that are defined on the WordPress Web site can be included in the auto-complete feature of Enterprise, allowing the user to add tags much more quickly because only part of the word needs to be entered. These tags therefore need to be imported into Enterprise Server. Step 1. 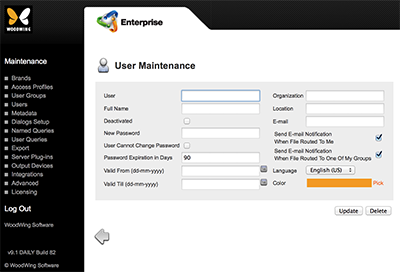 Access the WordPress Maintenance page in Enterprise Server. Step 1b. Click WordPress. The WordPress Maintenance page appears. Figure: The WordPress Maintenance page. Because this is the first import action, the Publish Form templates, users, categories and tags all need to be imported. Step 1c. Verify that the option Publish Form templates, users, categories and tags is selected. The items are imported and the result of the import action is displayed. The Publish Form for creating a WordPress post contains a field in which tags can be added. When a Suggestion Provider is installed such as the one from OpenCalais, tags can be automatically suggested. In order for the Suggestion Provider to know which tags to suggest, the Publish Form field needs to be linked to a tag entity. Step 2. In the Enterprise Suggestion Entity for tags field, enter the entity for the types of tags that need to be suggested by the Suggestion Provider. Example: When using OpenCalais, a good entity to use would be SocialTags. In Enterprise, publishing content to WordPress is done through a Publication Channel. Step 1d. From the Publish System	list, choose WordPress Publishing Connector. 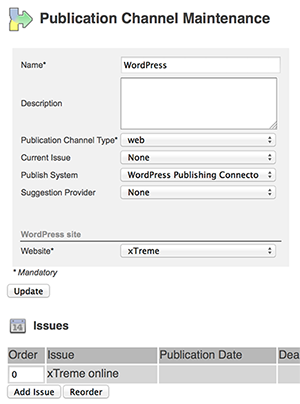 The WordPress Site and Issues sections appear. Step 3. From the Website list in the WordPress Site section, choose the WordPress site to which the content is going to be published. Step 5. Create an Issue by clicking the Add Issue button and subsequently entering at least a name for the Issue. Figure: A Publication Channel set up for publishing to WordPress. Step 3. Only select the Publish To WordPress test. This completes the process of integrating WordPress in Enterprise Server. Publishing posts to WordPress is done from Content Station. For more information, see Publishing to WordPress. When publishing from Enterprise to WordPress and your assets are (partly) stored in Elvis 4 or Elvis 5, you can add a button to the toolbar of the WordPress editor that allows you to easily add assets from Elvis to your WordPress post or page. Figure: By adding an Elvis button to the toolbar of the WordPress editor, you can easily include images from Elvis in your WordPress post or page. To add the button, the Elvis plug-in for WordPress needs to be installed. Instructions on how to do this can be found in the Elvis documentation.